VANGUARD IS BRINGING THE HEAT TO PHOTOPLUS EXPO 2018! WHITMORE LAKE, MI – VANGUARD, a global leader in photo-video accessories and sports optics, is excited to present at this year’s highly anticipated PhotoPlus Expo (PPE) in New York. PPE will be an opportune time for Vanguard to show off all of its most recent innovations, including the award-winning ALTA Pro 2+ and VEO2 tripods, the new (also award-winning) ALTA FLY 55T trolley backpack, and even some soon-to-be-released gems left hiding behind the figurative curtain! And speaking of awards, Vanguard is honored to be a finalist in two major categories for the LUCIE Technical Awards while in New York! Vanguard’s ALTA Fly 55T Trolley Backpack combo is up for “Best Bag”, and the ALTA Pro 2+ 263CGHT carbon fiber tripod kit (w/ grip head) is in the running for “Best Tripod”. Winners will be announced on October 25. Members of the media are encouraged to reserve a time to speak with the Vanguard team, as several key Vanguard marketing contacts will be on-hand. 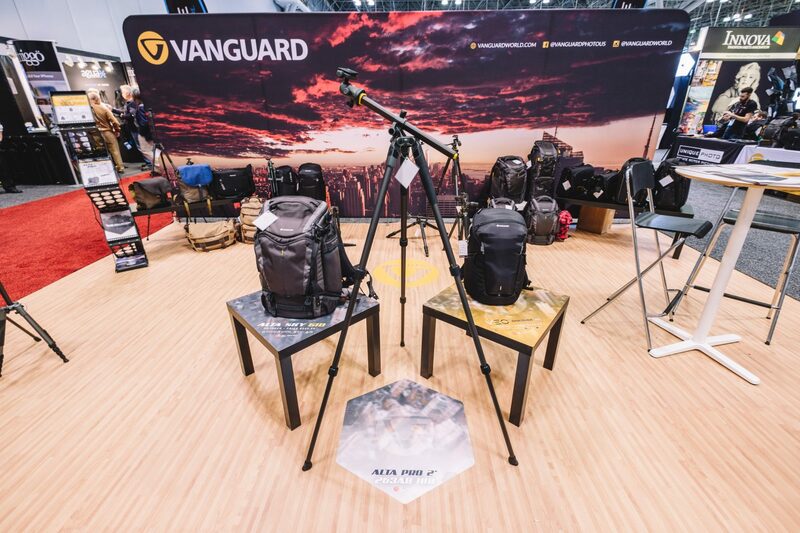 Vanguard’s latest and greatest tripods and camera bags will be on display in the booth, with opportunities to purchase through several official Vanguard retailers including Unique Photo, Adorama, and B&H Photo. You will not find a better price all year than what is being presented at this show! “Over the past 3 years, Vanguard has changed the way we create products. The design teams have demonstrated true care for the photographers that are going to use these products. Our goal was not to design and manufacture something beautiful, but also to be first to bring collections to the market that will define the user’s experience.” said Joshua Pawlak, Global Marketing Director at Vanguard. Perhaps equally exciting are all of the “extracurriculars” Vanguard has planned during its New York stay. With 4 of the major camera manufacturers releasing new mirrorless systems in the last couple of months, there’s only one thing that’s not debatable; they all deserve a VEO2 tripod underneath! Putting that aside, Vanguard has decided to up-the-ante, arranging for 4 brand loyalists – equally successful in their own right - to meet up in the streets of New York for a no-holds-barred mirrorless showdown for the ages. Vanguard will be there to film the experience, with limited invites being extended to the general public. Visit the Vanguard booth (142) to discover where and when it’s all going down! Be sure to also follow all 4 of our BRAGGING RIGHTS pros on Instagram, as we guarantee some major smack talk will commence between now and then! LEARN FROM THE PROS! 3 Vanguard Pros offering their 3 unique perspectives of the New York City skyline from Brooklyn Bridge Park. Capture the lights and color of New York City from a very special vantage point! PLUS learn composition, camera settings, and how to capture the perfect sunset from industry professionals! The post Visit Vanguard at the 2018 Photo Plus Expo in New York! appeared first on .